What type of sand in-fill is right for a putting green? Posted by Steve on June 12, 2012 Comments Off on What type of sand in-fill is right for a putting green? Southwest Greens of the Valley can build you a putting green, but that’s just half the battle! What about your short game? We offer many different types and styles of lawns that make for great chipping practice. Those include: 1” Fairway, 1 ¾” Second Cut, 2” Deep Rough and Ultimate Tee Box Turf –Tight Lie. We can also build grass bunkers or sand bunkers. Our recommendation is to build sand bunkers 6-8 feet away from the putting green, so the sand does not splash on the putting green which is in-filled #20 sieve round ball bearing sand which is a different sand than bunker sand. Get out your sand wedge! We use only the best sand for our putting greens. The #20 sieve round ball bearing silica sand is meant specifically for putting greens. Round ball bearing sand does not cut at the blades like a sub-angular sand, and will add years to your golf green. Southwest Greens of the Valley also uses a mix of black and green round ball bearing sand for top dressing your putting green to give it a beautiful color and a long life. Be aware: our Southwest Greens of the Valley round ball bearing sand does not have sharp edges, which will cut at the blades while you are walking on your putting green. This will also give your putting green a longer lifespan. Sand trap sand, or bunker sand, are angular sands that contain a little silt and clay. This will affect the roll of the ball when putting. It will also clump up if it gets wet. What are the different types of synthetic turf for putting greens? 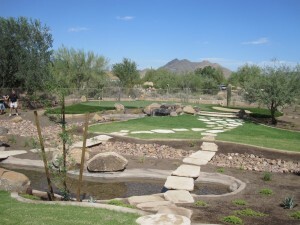 Posted by Steve on June 8, 2012 Comments Off on What are the different types of synthetic turf for putting greens? Putting is half the fun, chipping can really improve your game! Fairway/Rec Turf is our 1” first cut turf that we install as an apron around your green or as an area leading up to the golf green, which gives you a tight fairway lie to chip from. GB80 or Bermuda 72 are our 2” turfs which give you the opportunity to chip from a deep rough situation. 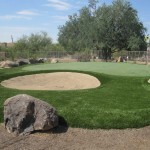 Ultimate Tee Box Turf—This is our tee box turf that we install at driving ranges. We can build a tee box using Ultimate Tee which gives you a very tight lie, or we can offer you a portable pad in any size that you can place in different parts of your yard. This will give you all chipping angles to your golf green (you can also put a tee in it to drive), which means you can set up a net to hit every club in your bag. The best of everything from Southwest Greens of the Valley!